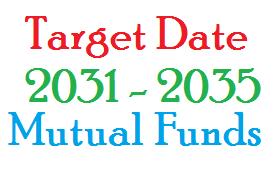 Find best target date 2031-2035 mutual funds. This target date funds are popular among 401k or individual retirement account (IRA) investors. Target date mutual funds are popular among any investors. Whether you have a 401k plan, individual retirement account (IRA), or regular investment account; you will find the target date mutual funds for your choice. These funds are suitable for passive investors that want to balance between stocks & bonds. These funds will adjust their assets based on your retirement year target. Target Date 2031-2035 fund provide a diversified exposure to stocks, bonds, and cash for those investors who have a specific date in mind (in this case, the years 2031-2035) for retirement or another goal. The investment risks may include market risk, index tracking risk, investment style risk, etc. These target date mutual funds are also known as lifecycle mutual funds. These top performer target date mutual funds are sorted based on its 1 year total return. You may find other information such as expense ratio fee, portfolio turnover rate, management or index approach, performance, etc. You can find the fund review and comparison below. T. Rowe Price Retirement 2035 Fund uses its assets to purchase a diversified portfolio of other T. Rowe Price stock and bond funds that represent various asset classes and sectors. The fund manager is Jerome A. Clark. There is no sales load. The dividend yield is 0.97%. Total net assets are $11.2 billion. Its expense fee is 0.77% per year. Morningstar has ranked this top target date 2031-2035 mutual fund with gold and 5 star rating. In 2014, it has year to date return of 6.14%. It has returned 16.97% over the past 1 year, and 12.14% over the past 3 year. You can buy this target date fund for your IRA or 401k account. Top 4 asset allocations are US stocks (55.39%), Non US Stocks (29.01%), Bonds (11.67%), and cash (3.17%). Top 5 fund holdings are T. Rowe Price Growth Stock Fund, T. Rowe Price Value fund, T. Rowe Price Equity Index 500 fund, T. Rowe Price New Income fund, and T. Rowe Price International Growth & Income fund. Ranked with 3 star rating, American Funds 2035 Target Date Retirement Fund has a yield of 1.20%. This balanced fund has total net assets of $2.6 billion. It has an annual expense fee of 0.76%. The portfolio turnover rate is only 2%. This target date fund has 3 year average return of 12.49%. The current share price is $13.49.There is also as sales load of 5.75%. You can buy this mutual fund from your brokerage with as little as $250. There are 62 brokerages for buying this investment fund. Vanguard Target Retirement 2035 Fund has a low expense fee of 0.18%. This no load fund invests mainly in other Vanguard mutual funds according to an asset allocation strategy designed for investors planning to retire and leave the workforce in or within a few years of 2035. With assets of $23 billion, it has a yield of 1.80%. Ranked with gold rating by Morningstar, it has 3 year annualized return of 11.50%. In 2014, the YTD return is 6.54%. Top 3 holdings are Vanguard Total Stock Market Index, Vanguard Total International Stock Index, and Vanguard Total Bond Market II Index. Schwab Target 2035 Fund is another best target date 2031-2035 mutual fund with 5 stars rating. This no load fund has an expense fee of 0.78%. With total assets of $262 million, this balanced fund is managed by Zifan Tang. The NAV (Net Asset Value) is $15.18.